The answer is quite simple. Larger cards are more likely to be seen, so if you’re in a competitive industry, go large so your message isn’t lost behind an envelope. 8.5×5.5 at least, or a unique size like 4.5”x12” will more likely grab the recipients attention. 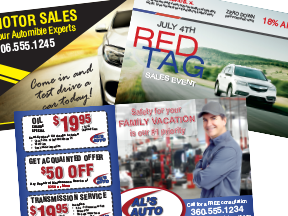 A small 4”x6” postcard should be used only by those businesses with no competition or if the business serves a very specific clientele with a niche product or service. Contact us to review the best options available for your next marketing campaign.